Epilogue: What is the moral of our story? Howdy, friends. In order to shave a few words off of this monster, I’m just going to jump right into it! For each contestant, I’m going to do two things: (1) list the contestant’s past archetype(s) (yes, there will be overlaps, so please bear with me) and (2) give a general prediction as to how they’ll do (I’ll do my best to make this second portion not so fanfiction-y). Let’s begin with the folks who’ve played this game a little more than others and go from there. To me, Cirie stands as perhaps the greatest contestant to never win (especially looking at her game in Micronesia). 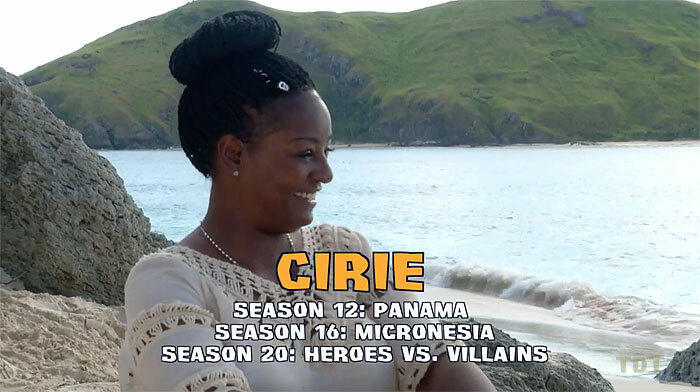 In Exile Island, Cirie was literally the “woman to get off the couch” (a fact Probst can’t help but remind us of every chance he gets), embodying the “everywoman” archetype. Put simply, Cirie was a relatable figure who, though doomed by the edit to the likes of Terry and Aras, was a thorough fan-favorite, and why shouldn’t she be? I think every average person who’s dreamed of playing saw a little of themselves in Cirie. By the time Micronesia rolled around, Cirie had evolved into the archetypal “magician”—i.e. someone who made their own fate in the game, manipulating the environment around her and bending it to her will. She situated herself in an early dominant alliance, and through one of the best social games ever played, maneuvered herself to what should have been an easy final three victory (RIP to the final three that season). Yes, she faltered in the role of the “ruler” (one who is defined by seeking and exercising power) as she gunned for the great Tom Westman, but HvV was a fluke. 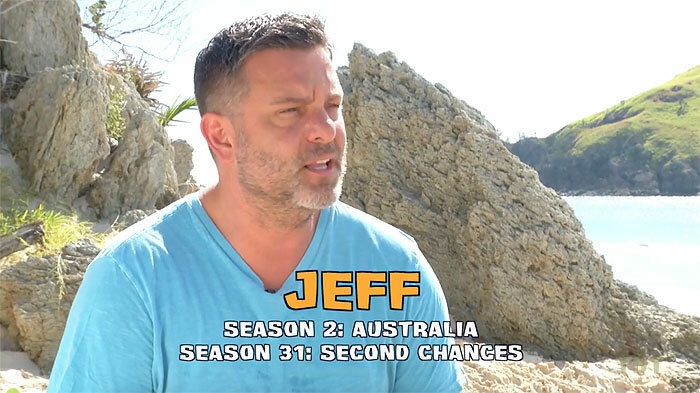 Unlike many “rulers,” Cirie was not arrogant or over-confident in her role, and had JT stuck with the plan, we would’ve gotten Cirie’s prolonged life and Colby’s early exit. *sigh* It wasn’t meant to be. Prediction: The woman knows the game, and I’d be terrified to be on the same island as her. I’m sure other players know that, too, but something tells me Cirie’s going to find a way into a strong alliance. She is one of the only “game changers” in this cast, and this is the season where she reminds everyone of that. Really? Again? 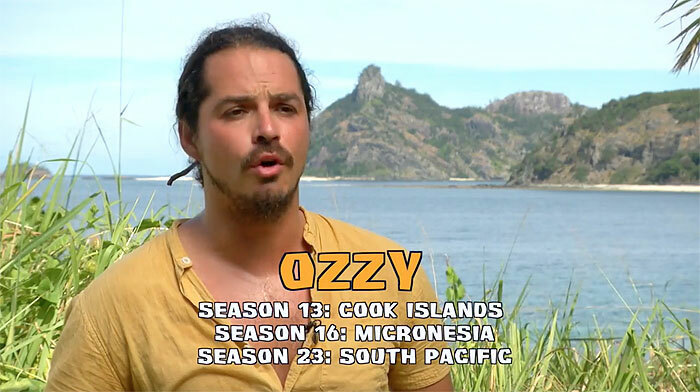 I don’t dislike Ozzy, and while his arrogance is tiresome, he is an accomplished player (after all, no one else can claim being voted out three times in one season). 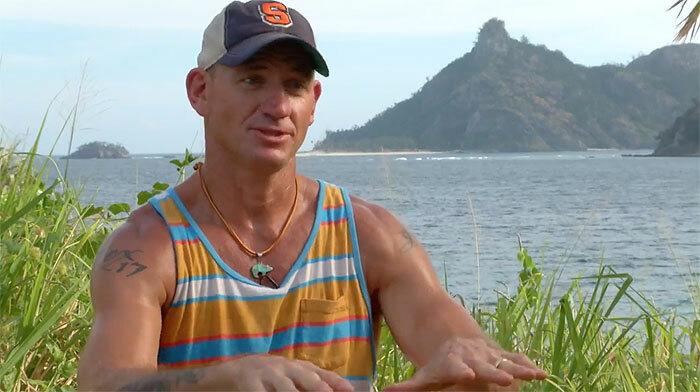 Ozzy’s best hope is as his original Cook Islands archetype as the “antihero.” He was in the alliance you wanted to root for, but his triumphs were always marred in his original season. Marred by what, you ask? The simple fact that he was not Yul Kwon, a far more likable (and therefore heroic) figure. Unlike Cirie, when Ozzy was given the ruler archetype, his arrogance shone bright, leading to an idol-in-the-pocket blindside in Micronesia. While he was finally given the “tragic hero” edit in South Pacific (the one the fans root for, who fights and fights and fights but ultimately falls short), I don’t think we’re going to see a repeat of that. Prediction: With a cast saturated with physical talent, Ozzy should blend in early-game, but come Merge time, or just before it, why keep a social stigma and challenge threat around? Still, the man can win challenges and his social game isn’t Troyzan or Culpepper bad. That counts for something, right? While I may not love Andrea, I think she’s a solid player. CBS obviously holds her in high regards as they painted her as the tragic hero of her original season (I’ll never forget the promo line for episode three of Redemption Island where Probst voiceover said something like: “Hell hath no fury like Andrea scorned”), but for all of their efforts, Andrea didn’t do much but come back from Redemption Island for a single vote. I respected her game a lot more in Caramoan, but like so many other rulers, Andrea let herself relax in Eddie Fox’s wonderful(ly inept) arms, and to the Jury she went. Will she learn from past, albeit small, mistakes? Prediction: Yes. I think she will. Andrea has a lot of things to like about her, and while I think she’ll make the most of her third go at the game, this is the best competition she’s faced. She’ll make waves, but she’ll fall short of the title and likely even the FTC for a third time in a row. Wait…this isn’t the same gal who voted out her mother…right? Let’s ask Jeff Probst, because I’m sure he’d love another excuse to remind us. On a serious note, I find myself fairly frustrated at Ciera being known for voting out Laura in BvW1, as I think she’s a great player. Both in her original season and Cambodia, Ciera was a magician. She shouldn’t have survived to the merge in BvW, yet she found a way (with aid from a horrendous social game by Brad Culpepper), and she very easily could’ve made a deep run in Cambodia if not for a selfless-Jeremy idol, despite coming into the Merge in a bad spot. While I don’t think Ciera is an elite player (although I think she could be), she is someone who makes her own luck. I’m happy to see her back. I have mixed feelings on seeing JT back. 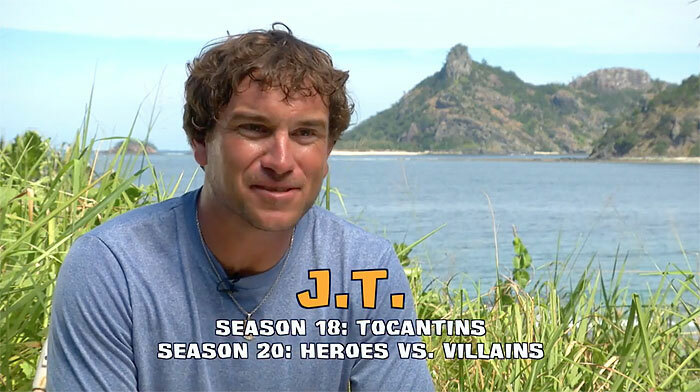 Much like Tom Westman (whose “hero” edit is most comparable to JT’s in their original seasons), JT’s legacy couldn’t possibly live up to the paragon-heroics in Tocantins. Hell, when the first juror says in a confessional while still in the game that he wants JT to win…come on. The Goldenest of Golden Boys. Prediction:…that is if he’s around long enough to be relevant. I have a hard time believing this cast will be so gracious as to let JT make it to the FTC, and I’m afraid, as soon as the crosshairs are on JT, the dude is toast (but hey, maybe Ozzy can use him). Best of luck. As Ozzy was in South Pacific, Malcolm was in Philippines. The tragic hero, the fan favorite, fell after winning and strategizing himself just shy of the FTC. His edit in Caramoan was, however, more interesting, in my opinion. Malcolm was one of the few people to get a “creator” or “architect” edit in the history of the show—someone who found some inventive way to create a path for himself forward in such a way others have not tried. Yes, his double idol ploy failed thanks to Phillip’s martyrdom and Erik’s observation, but the man showed some serious creative and strategic chops. Bless casting for bringing him back. 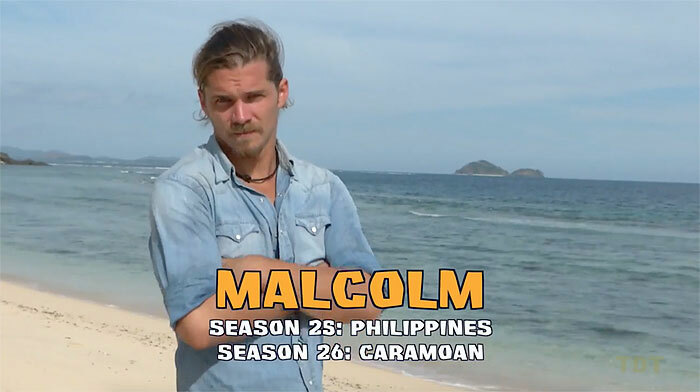 Prediction: While Malcolm is undoubtedly coming in as a target, I have a hard time believing he’d be displayed so prominently in the preview if he didn’t do at least marginally well. While I don’t want to call him a winner, I do think he is one the only man in this cast who can feasibly win—and I stand by that bold statement. 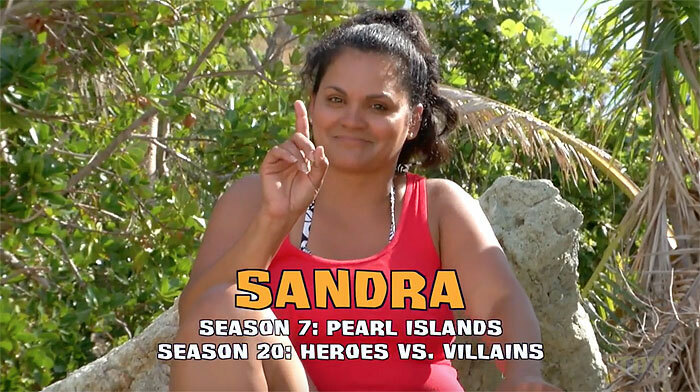 Much like Cirie’s first time, Pearl Islands Sandra was the everywoman: a relatable figure to the normal, casual fan. While she was eclipsed by some pretty large personalities in her season (Rupert, Lil, Fairplay), she was able to work her way to a well-deserved win. When I saw Sandra as a similar archetype in HvV, however, I’ll admit I was confused by her victory. Amidst gamers like Amanda, Russell, Parvati, and Boston Rob, in addition to more big personalities in Rupert and Coach, Sandra seemed pretty plain. Still, her UTR strategy has served her well, and it’s hard to comment on all facets of her game when so much of it was undoubtedly left in editing in favor of villainous antics and heroic bravado. Prediction: While I think we’re going to see Sandra in more of a “ruler” role, her rule will be overthrown this time around. How could it not? She should’ve rested on her laurels. I understand bringing back an original everyman from an early season like Australia (because, come on, especially in the early days, wouldn’t you have considered stepping down for peanut butter?) for a season premised on “second chances.” That being said, why bring him back again after failing miserably a second time? Sure, his Cambodia archetype—the Shakespearean fool (i.e. one hell of an entertaining narrator)—was very amusing, but I don’t really like the idea of bringing back someone who failed to be on the Jury twice. Hell, give Jim Rice a shot. Prediction: Although Varner is the weakest physical male this season, I don’t think this will hurt him much. So long as he can chill out a little, keep his head down, and pray he’s not on a tribe who sees a plethora of Tribal Councils, he’ll make the Merge. From there, I have a hard time believing he doesn’t just try to go all out too early, and while the likes of Ozzy, JT, and Troyzan will be targeted over him (Culpepper and/or Caleb, too, if they find miracle routes to the Merge), Varner is done soon thereafter. An entertaining man does not a good contestant make…at least not always. Few embody the role of the “philosopher” or “scholar” better than Aubry. Her game was entirely based around playing with facts, gathering information left and right to always find herself in the know at post-merge-Tribals. While she showed remarkable adaptability after two unlucky evacs, what keeps her from an archetypal magician is her unwillingness to go with her gut and just wing it, as well as her reserved strategizing with those outside of her immediate alliance (as noted by Julia and Jason in postgame interviews). Had she shared her knowledge and worked with others (perhaps with a little help from Tai, his extra vote, and Jason), and she might’ve found a way to oust Michele. Alas, she went with her numbers, leading to her defeat. Prediction: A victim of a bitter Jury, Aubry’s runner-up placement might actually help her. 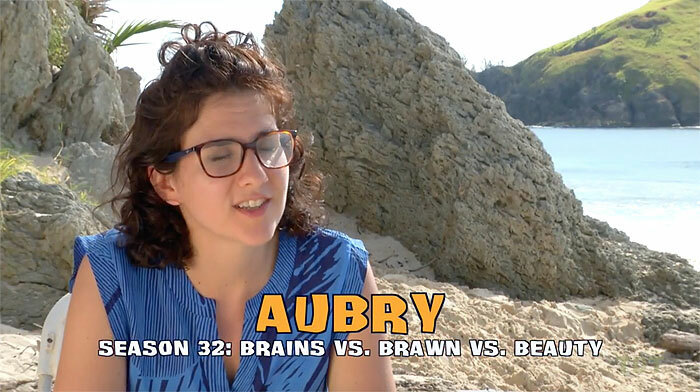 The spotlight will be on the actual winners in the cast this season, and while I think Aubry making it back to the FTC is unlikely, she won’t disappoint. Okay, had Caleb’s nauseatingly heroic edit continued, both JT and Tom would look like villains in comparison. I’m obviously hyperbolizing, but I just don’t love this casting choice. I’m not a fan of just bringing back someone because they were medevacced, considering we’ve given been Russell Swan and Skupin in the past. To be honest, I would’ve rather seen either of them instead. Prediction: I have a hard time believing anyone who was content being a loose number four in an alliance of four (as Anna told him he was before his tragic evac) is savvy enough to hack it. He’s also too physical to keep around. Enjoy your loser’s trip, bud. He was the villain in his season. I don’t think I have to explain that archetype. At least he gives us someone to fervently root against. Prediction: **** you, Brad Culpepper. 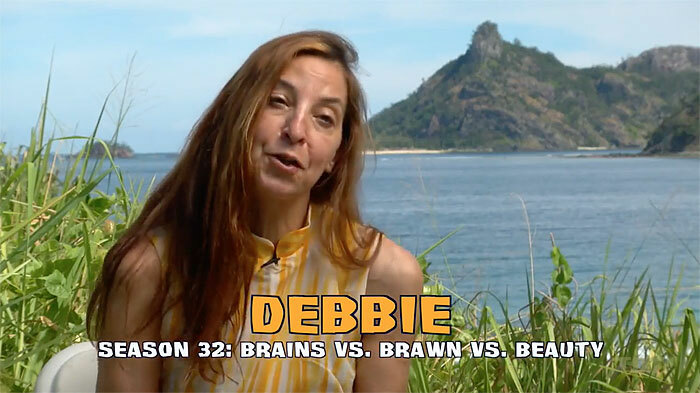 The wannabe ruler of Kaoh Rong, Debbie was destined to fall in her original season. It takes a special type of person to work a ruler edit into a victorious one (not many can equal Empress Kim), and Debbie’s erratic personality doomed her to a certain level of obliviousness when it mattered most. Maybe she learned to hold back just a bit? Prediction: I hope so much that I’m wrong about this one, but I don’t think Debbie is going to lighten up with the antics (or the changing professions in her confessionals). I love Debbie. I think she’s great for the game and one of the most memorable female players in recent memory, but I have a hard time seeing her lasting. But again. Please let me be wrong. While she might not have made a huge impact in Worlds Apart, I loved watching the Southern-Shakespearean-Fool narrate her way to the first Jury seat. She narrated the season’s theme well, and seemed particularly self-aware (which is likely why she was targeted before Jenn and Shirin). I hope her comic relief about her love of ‘Murica can evolve into something more than a first Juror, but who’s to say? Michaela’s debut had all the signs of a hero with some non-conventional-heroic attitude. She is the perfect antihero, one who stole the show for the time she was on MvGX. Her blindside is one of the most pertinent in recent history, and had she just stayed a little more conservative with exposing her strategy, this gal could have run the show post-merge. I see the makings of a more animated Kim Spradlin, and I do not say that lightly. 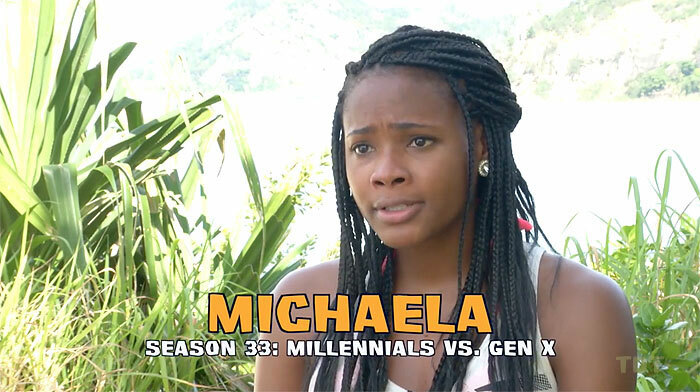 Prediction: Unfortunately, unlike Kim, Michaela showed herself to be a rather emotional player, one who initially appeared at the bottom of her tribe if Zeke’s assessment going into the Episode 2 Tribal is to be believed. Although this doesn’t by any means take her out of the running as a winner, it does create an uphill battle. That being said, why was Michaela put in the spotlight so much at the reunion and Zeke wasn’t even mentioned despite the pair being two of the most beloved members of the MvGX (and that’s saying a lot)? The simple answer, Michaela not only makes the merge, but she does better than Zeke. I may not be sure about many things, but I’d stake a lot on Michaela being around for a while, long after Zeke’s sendoff. And I hope she does. Sarah’s archetype is what appeared to doom her in Cagayan. Sarah was the archetypal “guide” or “mentor,” teaching the ultimate protagonist, and falling as a means to aid the protagonist’s journey. What did she teach and to whom, you ask? Well, despite the OG Brawn tribe never seeing a Tribal, Sarah’s alliance shifted from Cliff-Sarah-Lindsey-Woo to Sarah-Tony-Trish-Woo. Come the swap, she found herself alone and vastly outnumbered, but she appeared to get in well enough with the Brains + Jeremiah & Morgan to make it unscathed to the Merge. Put simply, Sarah was playing both sides for a good chunk of the game. Does her back-and-forth play remind you of anyone else from Cagayan? Maybe…I don’t know…the winner? Sarah fell so Tony could do what Sarah tried, only far better—or at least, that was what the editors would have us see. 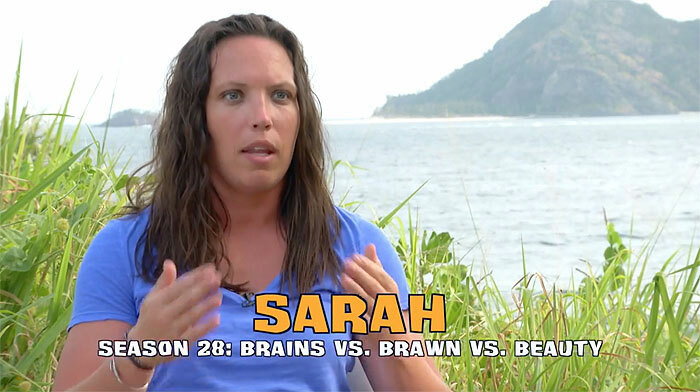 Still, anyone who can navigate between alliances successfully is dangerous, and give Sarah some traction, and I believe this woman to be deadly. I’m excited to see her go to more than two Tribals. The “lover” archetype is characterized by unflinching loyalty—sometimes to a fault—and a desire not to rock the boat with those the lover is close to. While I admire Sierra’s ability to put up with Dan and Rodney for weeks in Worlds Apart, she basically just went with the flow time and time again despite all of her talk of considering to go against them. If she has any hope to win, she needs a more dynamic game. Prediction: Sierra is the biggest head-scratcher for me in this cast. Who wanted her back when players like Cydney, Carolyn, Wentworth, Kass, Julia, Michele, newer Michelle, and even Hannah would have all been stellar choices as replacements (and that’s just from Season 30 and on!). Still, if she can put up with Dan Foley for all that time, she can surely deal with the likes of Troyzan, Tony, and Culpepper. Plus, she’s a physical woman (safe pre-merge) who seemed pretty passive strategically (non-threat post-merge), so why wouldn’t she stick around for a while? Sweet, sweet Tai. Has there even been a better paragon of the “saint” archetype in all of Survivor? Although he did backstab Jason and Scot in Kaoh Rong, in my mind, that move was seen as very altruistic, especially when paired with his overt love of animals and plants. He was a lock to return, and I’m happy it’s sooner rather than later. 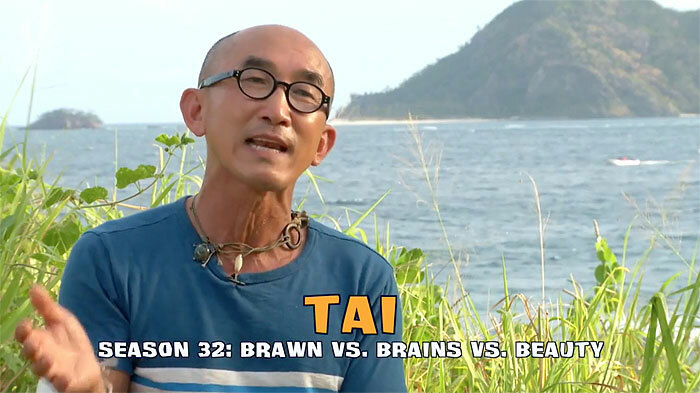 Prediction: Although Tai did have a lot of good ideas in Kaoh Rong (namely his fanatic targeting of Michelle with his extra vote even though no one else was on board), leading me to think the man is at least marginally game-savvy, his performance at his FTC tells me one thing: he cannot win. Still, no matter how poorly he might argue his worthiness, I don’t see other players gambling on him at the FTC again. Say what you will, he is likeable. A true “rebel” archetype, Tony, in my opinion, birthed Survivor’s voting-bloc era. I think of him as Heath Ledger’s Joker, a man who just wants to watch the world burn, yet finding some measure of dominance amid the chaos. Dragging Woo from group to group while always staying in the majority post-merge was masterful, but I don’t foresee anyone letting him do that again. Prediction: Tony’s rebellious, erratic behavior will make him a target immediately. While his Cagayan victory was remarkably well deserved, I don’t think anyone could win that way twice. 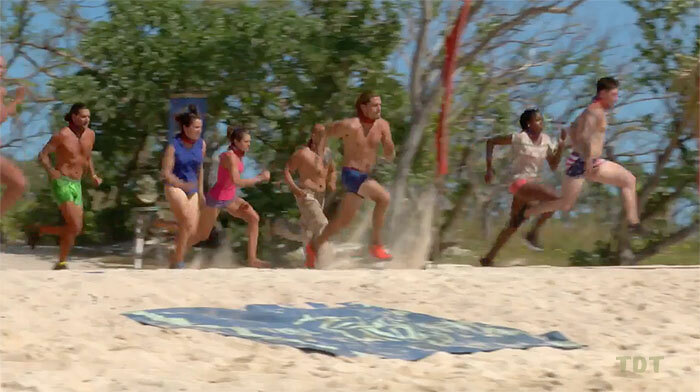 I really hope I’m wrong, but how could any rational person let Tony survive even a single Tribal? A less charming, but marginally more successful Debbie, Troyzan sought to be the ruler of One World. Of course, it’s hard to rule a group of people who hate your radiating arrogance (you asked to be called “Troyzan,” dude…come on). I get why he’s back, and he does deserve it over many of his One World peers who’ve already gotten the nod (Monica, Colton, and Kat…really?). That being said, I didn’t vote for him for Cambodia for a reason. 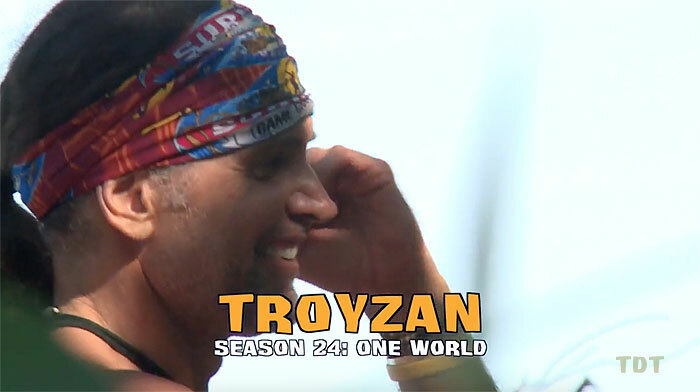 Prediction: I have to think Troyzan will be coming into his All-Star season more self-aware. Pair that with the fact he can help his tribe physically, I see him safely navigating the first few votes. That being said, I find it hard to believe the old Troyzan’s lackluster social game doesn’t show itself at some point, and as he is capable of winning immunities, he’ll go right around Merge time or just before it. As a stereotypical “wanderer,” Zeke roamed from group to group (much as a shapeshifter), but with one important detail—Survivor was not merely about the end, it was about the journey. 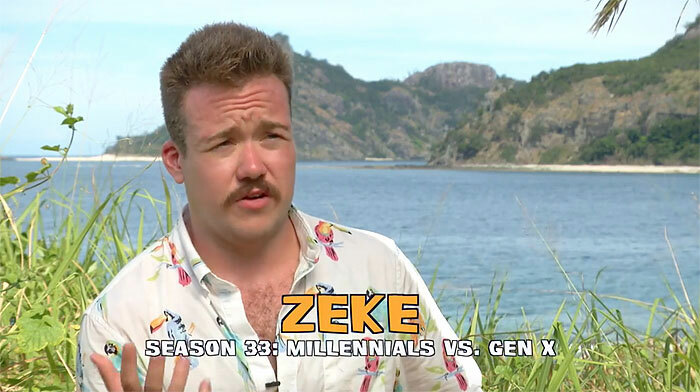 Zeke shifted his loyalty around a bunch, true, but the first episode showing him making fire says one thing: Zeke sees the game as bigger than him, and as a lover of the game… that really resonated with me. He clearly knows the game, and if he can make the Merge, who’s to say he couldn’t bounce around from voting bloc to voting bloc, worming his way to the FTC and maybe even a victory? Thanks for sifting through this, folks (or those of you still with me). Of course, there could be a good deal of shuffling with some players (namely Ozzy, Troyzan, Caleb, Culpepper, and JT—maybe Ciera and Cirie as well), but hey, how often are pre-season predictions right anyway? Please take my predictions with a grain of salt, and we’ll have a better idea about new archetypes after the premiere and how they affect people’s chances. Until then, I won’t waste any more of y’all’s time. 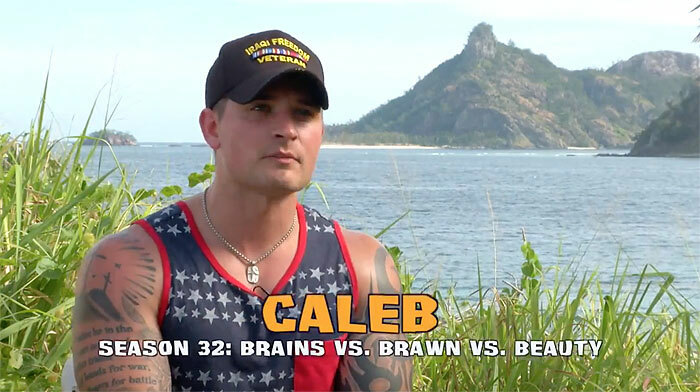 Cheers, and let’s hope this season is defined by it’s true, tested power players (Cirie & Malcolm) and it’s up-and-coming stars (Sarah & Michaela), not it’s questionable villains (Culpepper & Troyzan) and duds (Caleb & Sierra). Dan Otsuki has been watching Survivor religiously since season two, and is a recent graduate of the University of Puget Sound, where he double majored in English and Religious Studies. He's also applied to play on the show every time he's been able to do so.